1. You’ll need to start with 8 3inX3in pieces of paper. You can use as big or as small as you like, as long as it’s square. 2. 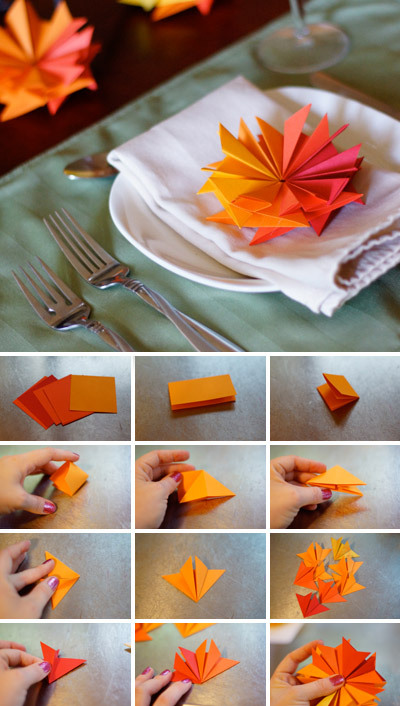 Fold the paper in half length wise then again. 3. Squash fold flat. It will look like a triangle. Do it again to the other side. 4. Take the edge of the triangle and fold into the middle. Do this to the other side as well. 5. Your pieces will look like this when you’re done. 6. Make seven more and now let’s glue this bad boy together. 7. Put a dab of glue under the right side flap. 8. Place the left tab under the right flap. Do this all the way around the form. 9. Place the glue under the right side flap on the last piece and carefully insert the left side of the first piece to glue.